PRINCE will be early next year. Still waiting for the liner notes to be complete. The lack of interest in this recording here is really shocking to me. Oh well, this will be released in about two months. The recording turned out fantastic with a very "up-front" sound to all of the instruments. I think anyone who loves Korngold will be very pleased. I'll let you know when it's released. Last edited by William Stromberg on Thu Apr 09, 2009 1:26 am, edited 1 time in total. Conducting Korngoldâ€™s music is just plain fun. Not only did he write some of the most gorgeous and joyously rambunctious music ever created for the cinema, he also wrote some of the most demanding for orchestra and conductor. You simply cannot be a â€œtime-beaterâ€ when conducting his musicâ€”it is written in such a way that it must feel like one man performing at a piano with a natural musical ebb and flow . . . only it actually involves seventy to eighty orchestra players all playing together! It seems, at times, that every measure has a different tempo, and I believe this is what helps give Korngoldâ€™s music its distinctive sound, which is very tricky and requires plenty of rehearsal time. Luckily, Iâ€™ve had the opportunity to conduct a lot of Korngoldâ€™s music over the last twelve years, including a thirty-eight-minute suite from Pauper back in the mid-nineties for BMG, to allow me to become very familiar with his style and perfect some of his original idiosyncratic performance qualities. As I began preparing my conductor scores for this new recording, I knew that I would try with all of my might to keep all the tempos up to those in the original film. I feel weâ€™ve come very close. Itâ€™s not often you get a second chance at a recording, so Iâ€™m pleased to be able to revisit this score and give it another shot. One of my personal favorite cues is Riot, which is performed at almost inhuman, breakneck speed. The orchestra had a ball playing it even though we felt as though it could derail at any moment. Also, I just love the cue Flirt with its slight Viennese lilt featuring two solo violins and tenor saxophone. Throughout this entire score Korngold utilizes his main themes to great effect, putting them through many variations. I hope one day to perform this music again, as well as other Korngold scores, live in concert to picture. Thanks for the information about the recording. A previous comment lamented a lack of interest in the recording. I don't think so at all. I think every right minded Korngoldian is looking very much forward to this recording. I think we have had a period with very little new developments regarding Korngold and people have just stopped writing here as a habit. Whatever our lack of comments (I think we were probably waiting for more detailed information) I think the recording will sell just as well and that all Korngoldians will be enthusiastic about it. I would personally like to thank Mr. Stromberg and his team for their fine advocacy of Korngold and other golden age composers with their recordings. Your first Prince and the Pauper was the first Korngold CD I ever bought, so I am especially looking forward to this fine score in its entirety. Would it be heretical on a Korngold site to especially thank you for the Salter/Skinner recordings....probably. I would second everything that Peter says..and no it is not heretical to salute Hans Salter & Frank Skinner. Any site devoted to Korngold is a home to great film music and its admirers. 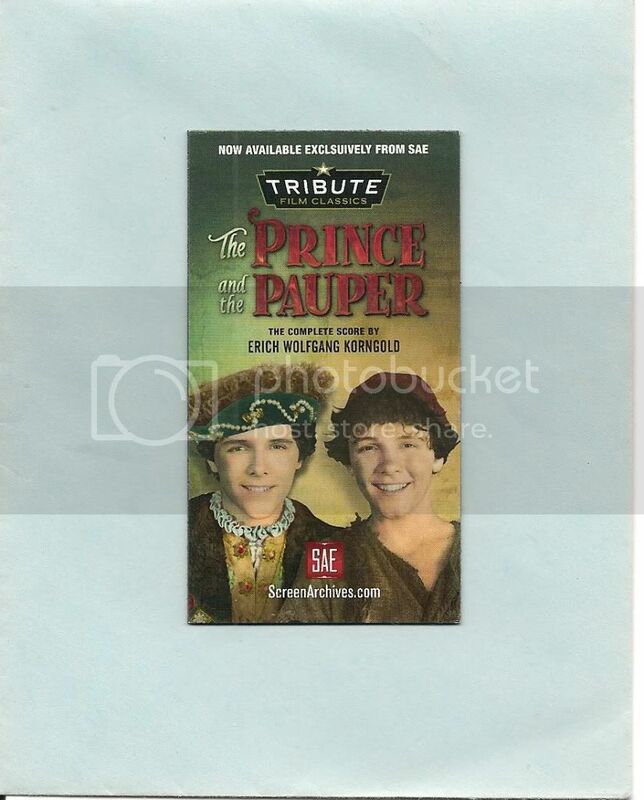 Counting the days to The PRINCE & THE PAUPER!!! The cover art alone is a joy! PS: If you need help obtaining this CD from Screen Archives Entertainment please let me know. If anyone missed it here is a link to my site reviewing it.